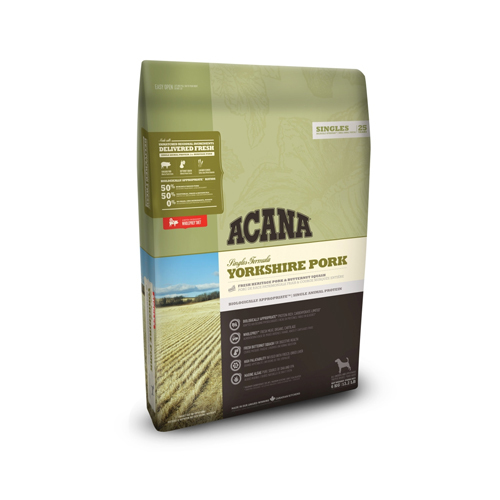 Acana Singles Yorkshire Pork is dog food with pumpkin and pork as only source of protein. Acana Singles is formulated with one single source of protein supplemented with a small amount of vegetables, fruits and herbs. The Singles mostly consists of nutrients that occur naturally in the ingredients; synthetic ingredients are reduced to a minimum. Acana Singles Yorkshire Pork contains pork and Red Delicious apples, pumpkins and chicory root, which help support a healthy digestion. This combination of ingredients makes Yorkshire Pork suitable as an elimination diet. Have you used Acana Singles Yorkshire Pork Dog before? Let us know what you think about this product.